Fifth grade Lesson Experiment: Which size of Alka Seltzer will shoot a canister the farthest? Experiment: Which size of Alka Seltzer will shoot a canister the farthest? SWBAT work through the steps of the scientific method to determine which size Alka Seltzer will cause a film canister lid to shoot the greatest distance. Students head outdoors to shoot off film canister lids using the power of an Alka Seltzer chemical reaction. Students will identify variables and work through the steps of the scientific method to test their hypothesis on whether the size of Alka Seltzer affects the size of the chemical reaction that occurs. Students will demonstrate success on this activity by following the steps of the procedure recorded in their notebooks and collecting accurate data. Have an Alka Seltzer tablet and a film canister half full of water. You will be discussing what will happen when you add the Alka Seltzer to the water prior to beginning the activity. Students will be shocked and excited when they see what happens in this warm up! 1 film canister per group, make sure the lid is tight fitting. Experiment steps for the Alka Seltzer experiment or the Procedure for Alka Seltzer experiment printed and precut for students depending on abilities in your class. You will need a large open space outside so that there is enough room for all groups to spread out. I build excitement in my students for today's experiment by having them make some predictions. I hold up an Alka Seltzer tablet and a film canister of water. I ask them to make predictions on what will happen when I place the Alka Seltzer in the water. Students tell me that they believe it will dissolve, some say bubble and fizz, others say the water may turn cloudy. I place the Alka Seltzer in the film canister, secure the lid, and point it at a wall. Students are shocked and surprised when the lid goes exploding off. I ask students to explain why the lid went shooting off. They can tell me that the Alka Seltzer starts bubbling and the pressure that is created causes the lid to shoot off. They do not express an understanding of what the bubbles are, or what is causing them. I explain that when the Alka Seltzer begins to dissolve in the water, a chemical reaction occurs which produces a gas. Those bubbles that can be observed are actually a gas being released. The gas soon fills the empty space in the container and just as the students said, pressure builds up. With no where to go, the pressure causes the lid to shoot off. Although the focus of this lesson is not on the actual chemical reaction that is taking place, rather working through the process of the scientific method, it is still important to discuss what is causing the experiment to occur. Having a good understanding of why it happens will help students think scientifically about what changes may affect the outcome. It will also help build background knowledge to pull from when we get to the next unit which does cover chemical reactions. After seeing the film canister lid explode off, I ask for ideas on how I could get the film canister to travel farther using the same canister and the same liquid (water)l. By asking them to think of ideas, I am promoting their science thinking and letting them take ownership in developing the question that we will be testing today (although I already have it planned out). I circulate while groups discuss possibilities. I record ideas on the whiteboard as groups share. Groups tell me I could change the amount of water, change the amount of Alka Seltzer, or shake the canister instead of just holding it. If one of the ideas you get is not to change the amount of Alka Seltzer, you could write it down anyway and say a group was discussing it. It is best if the students come up with this on their own because when they think they came up with the experiment it means more to them. I look over the list I have recorded on the board and select the test question related to changing the amount of Alka Seltzer. I tell students this will be the question for our experiment today: Does the amount of Alka Seltzer affect the distance the canister lid will shoot? I pass out a piece of copy paper that has already been trifolded for students. I have the same foldable in my notebook on the overhead as a visual for the students. I find that having an example helps students who struggle following directions, as well as those who need a visual for spelling. They glue the foldable into their science notebooks and record step 1: Question – Does the amount of Alka Seltzer affect the distance the canister lid will travel? In the upper left hand corner. 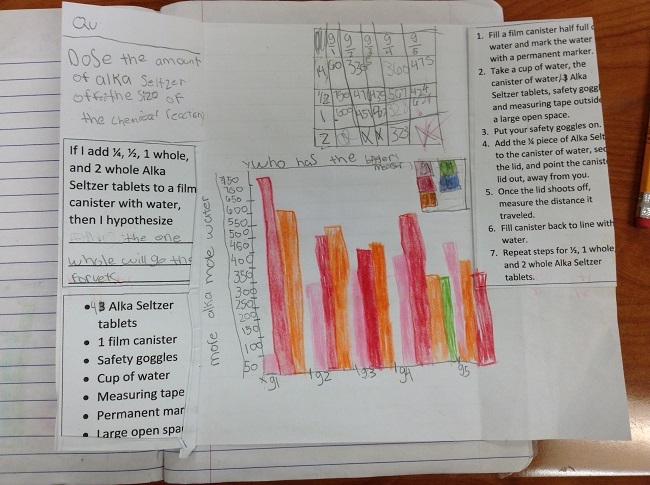 As students copy the question in their foldable, I pass out the Experiment steps for the Alka Seltzer experiment, or the Procedure for Alka Seltzer experiment, to all students. I have several ESE and ELL students who struggle with copying things, so in an effort to eliminate stress for them, and speed things up, I provide them with all of the steps. All other students copy everything except the procedure which is given to them because it is always long. I feel that hearing information, seeing it, and writing it down themselves, helps retain the information. I do realize that although this is ideal, it just is not practical for all of my students. Those who receive all of the steps typed out, receive them precut in a baggie so they are out of order. The students have to figure out the correct order. I have found that providing them with this visual also promotes participation from them because they have the answers in front of them. We continue adding the hypothesis, the materials, and the procedure into the foldable and discussing each step. As we discuss the procedure, I have two students come up and demonstrate the correct way to measure using a measuring tape. We discuss how important it is to record exact measurements. We agree that all groups will be measuring from the edge of the sidewalk where they will be standing, to the center of the film canister lid, wherever is lands. We create the data chart in the center of the foldable as well. The data chart has 5 rows and 6 columns. We do not have time or the resources for every group to repeat this experiment three times each as usual. In cases like this, I always have the groups share their data at the end and fill in the charts with the other groups’ information. So, in actuality we are conducting the experiment five times (1 per group), not just three. If you would like a larger view of the foldable you can check out this Picture of Foldable. Before I take the students outside to begin, we go over the variables and record them in our notebooks. This helps students focus on what they need to make sure is the same in each test. Students are able to tell me the dependent and independent variables easily. They identify the independent variable as being the different size Alka Seltzer tablets and the dependent variable as being the distance the lid travels. They list things such as the amount of water, the way you hold the canister (angle you hold it), and the canister you use as the control variables. They need a little help coming up with the fourth so I add that the place they shoot the canister must also remain the same. Once they find a starting point, they need to make sure they are starting from the same point (the edge of the sidewalk is a good marker) each time. I ask a student to repeat the steps of the procedure for the class. When they get to the part about holding the canister pointing away from them and others, I remind them this is extremely important and if I see them doing the wrong thing they will have to sit out and watch the experiment. I also remind them if the canister lid does not shoot off, to give it a little shake and continue holding it away from them. Sometimes the lid takes a while to shoot off. Students take their notebooks, pencil, and all materials needed outside and spread out so that they all have plenty of open space to conduct the experiment. They follow the steps of the procedure to begin testing their hypothesis. I circulate to observe and make sure they are measuring correctly and remain focused on the experiment. If any groups are not being precise in their measurements, I ask another group that is doing it correctly, to come model for them. I stay and watch the group measure again to make sure they do it correctly after the reteaching. The Students measuring for data video shows one group that did not keep their finger perfectly still when measuring and started over measuring. This tells me that they have a good understanding of my expectations. Once all groups have finished, or 30 minutes is up, I line all students up and we return to the classroom. I put my blank data chart on the overhead and ask each group, one at a time, to share their data with me. I record the data in my data chart and all other groups copy it down. Remember they only have one column of their data chart filled in for their group and are waiting for the results of the other groups to complete their chart. I have 15 minutes less time with my second class and that class did not have time to complete the experiment for the 2 whole tablets. Only one group got this completed. We crossed out the 2 tablets for this group in the data chart (you will see this in the foldable examples in the guided practice section). I used this as a teachable moment by asking students why we couldn't just finish the 2 whole Alka Seltzer tablets the following day. They were able to tell me that the variable of wind would be different. We discuss any differences we may see and what could have caused those differences. We noticed that group 5 got very different results then the other groups. They found that the 1/4 Alka Seltzer tablet went the farthest but they were the only group to get those results. The other four groups all found that the 1/2 or 1 whole went the farthest and we noticed that these measurements were all pretty close. I compared their results to my first class, which three out of the five groups found the 2 whole went the farthest, and the other 2 groups were split between the 1/2 and the 1 whole. I asked students to consider what could have caused these differences. Students came up with ideas of measuring wrong, shaking the canister, some groups noticed that their canisters took a lot longer to shoot off then others so they thought maybe their lids weren't all as tight as others. Group five also admitted that they knocked their cup of water over and had to run over to the water fountain outside to get more water. We discussed how using different water that is at a different temperature could have caused the difference in outcome. The focus of this isn't really to identify the one factor that caused the difference, rather to promote scientific thinking about how important keeping every variable the same, except the one being tested, is. 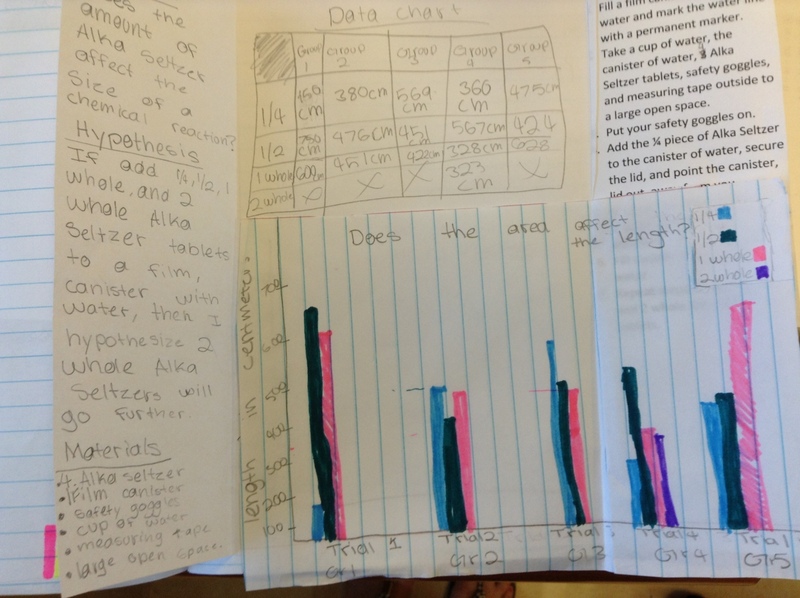 Students complete their graph to illustrate their data at home for homework. I choose a couple to share with the class the following day.